It would be a grave oversight to present the history of the Grand Canyon and not mention the native populations that long preceded the pioneers featured in our exhibit. Although it is imperative to make sure their story is heard, many museums and archives, including NAU Special Collections and Archives, do not have adequate primary source material to address this history from the Native American viewpoint. The voice of the pioneer and the colonizer has remained dominant in Western culture and, as such, archival material tends to present Native Americans through a discriminatory and/or exoticizing lens. By attempting to tell their story from our archives, we would be contributing to and perpetuating the outsider’s perspective. As members of a society that supports equality, truth, and transparency, we will only be including what we believe we can present responsibly. This will only be done virtually, to give context. To more completely explore the Native American perspective, please see the included links to a variety of tribal resources. The Hualapai and Havasupai came from the same cultural group but were separated by US government policy, leading to different tribes and subgroups that operate independently of one another. 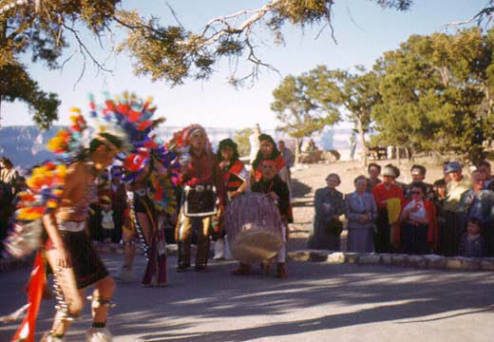 The Hualapai tribe or “People of the Tall Pines” are one of the most connected tribes to the Grand Canyon. Today, their tribal headquarters is in Peach Springs, Arizona, located between Kingman and Seligman. Most of the tribe's income derives from tourism. On the west end of the Grand Canyon, on their given reservation, they manage tours and run the Skywalk, a glass and steel horseshoe walkway that juts out 70’ over the rim. The Havasupai, or “People of the Blue-Green Water” have perhaps the most intimate relationship with the lands now contained in Grand Canyon National Park. Originally a migratory people, before European-American settlers arrived, the Havasupai roamed an area of 1.6 million acres across the Colorado Plateau and leading into the Grand Canyon. Beginning in 1882, the United States government reduced their lands to a 518-acre reservation in the bottom of the canyon, at current day Supai. Their small patch of land, despite being designated as a reservation, was used consistently by the park service after the designation of the Grand Canyon as a national monument, and eventually, national park. The confinement of the Havasupai in the canyon created great hardship for the people. Their summers were spent growing all food in the bottom of the canyon and living a mostly vegetarian diet. As winter came around, historically they would migrate up to the Colorado Plateau, living in solitude or in small groups and hunting small game to sustain themselves until the summer months returned. The confinement of the Havasupai to a small section of the canyon floor meant they could no longer provide for themselves easily in the winter. There was limited wood for fire and warmth, limited game, and no easy way out when snow and rain impeded the difficult 9 mile trail back up to the rim. The Navajo (Diné) consider the Colorado Plateau home. The Navajo Nation boundaries were determined in 1868 in a peace treaty between the tribe and the US government. They thrived on a mainly agriculturally-based economy which then shifted to resource extraction when oil and coal were discovered on their land. The US government created a tribal council (of non-native peoples) to bring large corporations into the area to extract these resources. 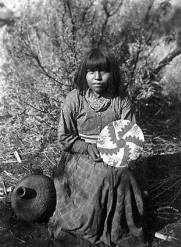 The Navajo are known for their intricate weaving techniques, learned after picking up weaving methods from Spanish conquistadors. Today they remain the largest Native American tribe with 27,000 sq. miles of land and 250,000 members. The tribal headquarters and the Navajo Nation Museum are in Window Rock, AZ. The Southern Paiute also claim traditional lands in the canyon. Glen Canyon dam was actually constructed on traditional Southern Paiute lands. They were removed from their lands by the US government in 1865 with the emergence of reservations and later restricted from use of Grand Canyon lands as it was put under various federal protections. It was not until the 1970s that they were offered limited use of resources on the North Rim. 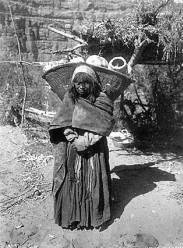 The Hopi are considered direct descendants from the ancient Puebloan peoples. They too have a relationship with lands in the Grand Canyon. Though originally they existed in the Four Corners region, they now live on a 1.5 million acre reservation that only includes a portion of this ancestral land. To live in such an arid climate, the Hopi practiced “dry farming”. This involves placing periodic “windbreakers” in the field to collect soil and moisture. They also used irrigation techniques on mesas below their dwellings. Their mastery of this technique yields an incredibly fruitful harvest despite harsh conditions. Main Sales Room. 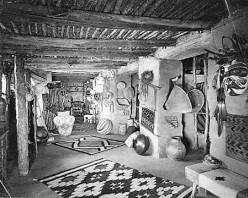 Arizona--Grand Canyon--Grand Canyon Village--Hopi House--Interior--Historical.